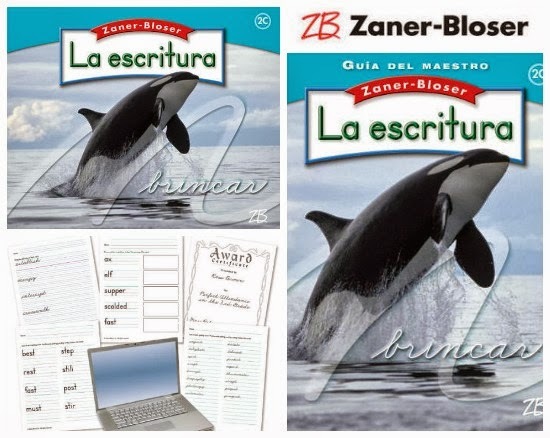 To accompany today's post on English and Spanish Cursive Writing Materials, I'm happy to host this giveaway from Zaner-Bloser. According to their website, the Zaner-Bloser Handwriting program "provides developmentally appropriate practice activities to promote automaticity [so that] students become more fluent at manuscript and cursive handwriting." I have not personally used the Zaner-Bloser Handwriting program, so this is not a review. They offered the set you see above to be given to one MommyMaestra reader through a giveaway on my site. If you enter and win this giveaway, I'd love to know your thoughts about the materials. The set above includes one Grade 2C Student Edition, one Grade 2C Teacher Guide, and a one-year license for ZB FontsOnline Plus. I think that the access to the FontsOnline Plus which allows you to create, save, and edit worksheets (or other documents) using their manuscript and cursive alphabets, is especially intriguing and one I'd love to have for use with my kids. To enter this giveaway, simply use the Rafflecopter below. Hace unos días, leí un articulo que criticaba el que las maestras en Texas, no tienen el tiempo necesario para enseñarle letra cursiva a los estudiantes, porque tienen que dedicar su tiempo en los exámenes del estado. Esta es una buena oportunidad para practicar en casa, lo que ellos no pueden aprender en la escuela. What a great resource. I hope we win. If not I think I will be buying it anyways! My 4th grade son began learning cursive last year and still struggles with it. My 1st grade daughter is interested in cursive writing. I agree, what a great resource! It is a great give away, I am a cursive writing fanatic! I am definitely for teaching cursive. When my sister told me many schools were cutting it from their curriculum, it did not sit well with me. I am very happy that it is still being taught in our school district. What an awesome giveaway! Would love to win this for my son. We are going to start working more o cursive with my older daughter. Would love to have some new materials to help. I really like this award because I am definitely in favor of a beautiful and legible handwriting in all people. Thanks for the draw.